It’s summertime in the Alps, and the scenery is even more varied and breathtaking than in the winter. Flowers are blooming, MontBlanc is shining in all her glory, and the villages of the French alps are as pristine as the babbling brooks that run through them. As we arrived by train via Paris, we spotted the effortlessly cool Jane Birkin on our same route. And that pretty much sums it up- the alps in the summer is all about refined chic. Not ostentatious. Nature loving. Here at Eden Luxury Homes, our team has been hard at work managing our summer rentals, the majority of which happen in the South of France and Ibiza. But around a quarter of our clients are coming to Megève this summer, and its not difficult to see why. In Megève, cafés like Le Cintra and le Bistrot will draw you in for hours over leisurely lunches and bottles of rosé, and the evening concert series echos through the town as you dine al fresco at one of the gastronomic restaurants. Meanwhile, keep in mind that Megève offers the best luxury chalets in the alps. They are not just for winter enjoyment! Many of the chalets boast outdoor swimming pools, sun decks, direct access to the golf course, and sweeping panoramas of the mountains. Leave the windows open and enjoy fresh mountain breezes, the wafting smell of wildflowers, and the sound of chirping birds. You might just find yourself humming a melody from John Denver’s Greatest Hits. 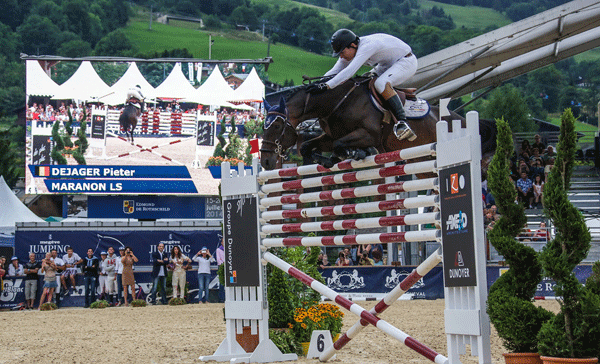 Six days of professional and amateur show jumping in the heart of Megève, with free entry and evening cocktail parties. Stage 7 and 8 of this cycling World Tour race comes through Megève and Saint Gervais, bringing in the biggest teams in the cycling world.